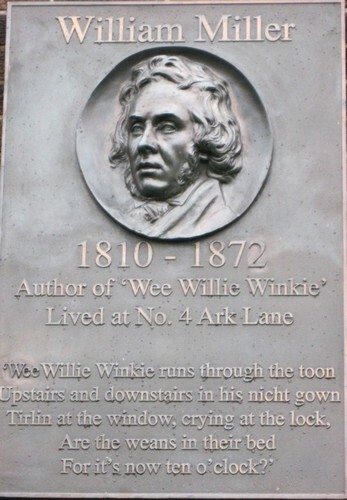 The author of Wee Willie Winkie , A Wonderful Wean, “Lady Summer”, John Frost, and other songs and poems was born in the Bridgegate of Glasgow in August, 1810. He was in the habit of afterwards referring to it as “a merry spotin the days of yore”, his recollections being bright and happy. While he was still young his parents removed to the village of Parkhead, where he spent his boyhood days. It was intended he should become a doctor, and he studied for some time with this purpose in view, but a serious illness when he was sixteen years of age prevented this idea being carried out. He was then apprenticed to a wood turner, and in this craft he became a skilful workman, cabinet making being his particular line. The trade continued to be the business of his life, and he wrought at it until a short time before his death. He early showed a talent for verse making and before he was twenty years of age he was contributing to the poetical columns of the local papers, and as time went on to various national journals and periodicals . It was at this time, in 1832 one hundred years ago that the famous “Whistlebinkie” series was issued, consisting chiefly of the original poems humorous and pathetic by local poets, many of whose names are still well known to students of Scottish poetry. In later years Miller resided at No4 Ark Lane, Dennistoun, and i have spoken to and been in communication with those who remember him at this time. He went out and in from his home, except during working hours, dressed with a tall hat and morning coat. His wife had a reputation of her own, and was known as “Cat Jean”, owing to her fondness for cats, as she gathered together in her home all the stray and homeless cats that came her way, sometimes to the number of a dozen and attended to their welfare. In 1865 Miller issued what is now an exceedingly rare collection of Nursery Rhymes and Poems, in which his reputation as a poet became widely known. Although laid aside by illness in the winter of 1871 he still continued to contribute to various papers. However, as his condition was not improving, his friends, in the spring 1872 took him to Blantyre for a change, but as he was getting weaker in health he was brought back to the house of his son, Stephen (the original of “The Wonderfu Wean,” where he died on 20th August, 1872, having just completed his sixty second year. He was buried in Tollcross Churchyard, but a fine monument to his memory was erected by public subscription in the Glasgow Necropolis, with a plaque giving his profile. Strange to say, at Tollcross where his body rest, it is a Nameless grave, as there is no mention that he lies there, and the names on the headstone give no clue to this effect. In appearance Miller was tall, with well cut features, his countenance being ennobled by a lofty forehead. He had a kindly way, and a quick manner of speaking , besides having a hurried, nervous gait. Robert Buchanan, the novelist, who was the first to term him “the Laureate of the Nursery” said of him, Wherever Scottish children have been born the songs of William Miller have been sung, and i can scarcely conceive a period when he will be forgotten certainly not until Doric Scots is obliterated. The story is told that Rev. George Gilfillan, the great Scottish preacher and writer, was giving one of his popular lectures in the City Hall of Glasgow, and chanced to refer to Wee Willie Winkie, as the greatest nursery song in the world.